Written on August 8, 2011 . Posted in Architecture and Design, Updates from & for Faculty. in the surfaces themselves. 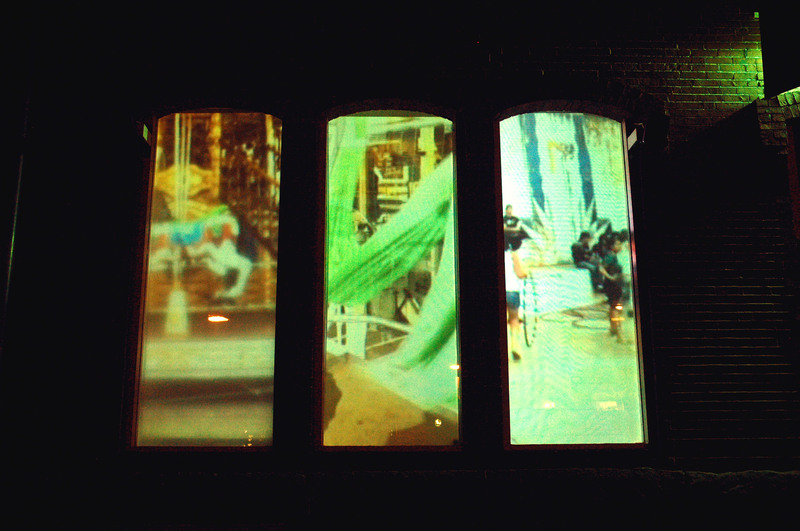 The videos examine the notion of an elusive edge, tracing a continuous and animated trajectory within a public space. SÁBADO portrays the center of an empty carousel along its perimeter, while DOMINGO explores the circumference of a bustling plaza in Mexico from the inside-outward. Referencing the movement and mechanics of the installation, IN BETWEEN speaks to the fluid connections between experience, time and place, and provokes new readings between place and placelessness. Set to the musical score of violinist and composer Rafael Rondeau, this video installation aims to reveal the possible intimacies present within a public realm. Click here to see a preview of Guest’s “TRIPTYCH: SABADO/IN BETWEEN/DOMINGO”, a three-channel video on view in the exhibition. Guest received the support of RISD’s Professional Development Fund to realize this project.